Barnabas Piper has lived his life as the son of one of the most well-known pastors in the world. 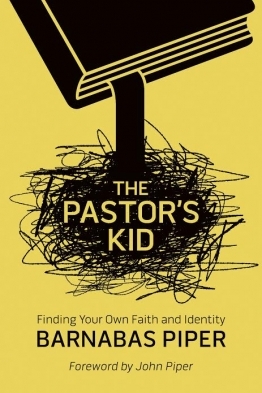 In his new book, The Pastor’s Kid: Finding Your Own Faith and Identity he shares about his own experiences growing up with John Piper as his father. The book has been getting some attention, and for good reason. Barnabas talked with dozens of PKs (pastor’s kids), and his book relays some of their stories in order to give the reader a better understanding of life in that bubble. The Pastor’s Kid is an honest look at life as a PK, but not an overly critical look. He is open about the difficulties that come with having a father in the ministry, but he also recognizes the benefits that can develop and grow from this experience. Here’s a book that gives a voice to PKs, helps pastors avoid some of the common pitfalls, and encourages churches to better understand the pressures on their pastor and his family. Barnabas talked some with me recently about his book, what makes PKs unique, as well as the challenges and blessings of seeing church life up close and personal. Trevin: One of the questions I had as I started reading your book was about the common “fishbowl” illustration. Pastors’ kids grow up in an environment in which people are always watching them. I wonder, though, how much of this could be applied to any family where the parent is well known in the community and/or a family’s faith is on display. Are singers’ kids expected to have good singers’ voices? Are politicians’ kids expected to be savvy and personable? Are doctors’ kids expected to have a knack for medicine? So my question is this: What is it about pastors’ kids that has led to the PK label and brought additional, spiritual challenges that are unique? Barnabas: That’s a really good question. If there is no difference between PKs and any other child under scrutiny, my book is a big waste of time! The biggest difference between PKs and any other children of well-known parents is the spiritual aspect of things, especially the “calling” aspect of pastoral ministry. A singer might be known widely, but they are known for a talent. A politician is known for a position. A pastor is known for being close to God, at least tacitly if not explicitly. With that closeness to God, the call to ministry, comes a public life and all the requisite scrutiny. All those other public positions are about what someone does – even the president of the United States. So for their kids to do something different or to be a different kind of person is generally more acceptable. If their kids are total screw-ups it has little bearing on what they do. A pastor, though is about being something, really being a whole lot of somethings, for a group of people. If a PK goes down a divergent path (even a moral one), it calls into question the identity of the pastor in the eyes of the congregation. Trevin: In your conversations with other PKs, you mention the common sentiment that a child will feel toward the church: a sense of rivalry. Lots of kids probably feel a sense of rivalry toward the place where their fathers or mothers work. How does the feeling of rivalry with the church impact a PK spiritually, more so than another kid’s feeling of rivalry with the office? Barnabas: Because the rivalry is inherently spiritual. It’s not just about time at the office, or dad always being on his cell phone. It’s about those things tied directly to God. When dad has tensions with co-workers, it’s in the name of God. When parishioners treat dad like dirt, it’s in the house of God. It can be difficult for a PK to connect directly with God on a personal level because God is not necessarily a personal being. He is tied to his dad’s career and the rhythms of working life. All the good and bad things that happen in Dad’s work can directly affect a PKs view of God and ability/desire to follow Him. The PK has a great relationship with God. The PK has a great relationship with the family. The PK loves the church. The PK is confident in His beliefs. The PK is a leader. Which of these five do you find most prevalent? Which of these five did you struggle with the most? Barnabas: I think the first one is most prevalent because it sort of underpins the others. The assumption that PKs are close to God is directly tied to how much they love the church and family and how well prepared they are to lead. Up through college, I especially struggled with my relationship with God. I didn’t even realize I was struggling, but the reality was that all that I knew of God didn’t equate to a relationship with God. I rode my confidence in what I believed, but didn’t connect with God in a personal way until later. That’s a larger story, and I tell much of it in the book. Currently, the expectation to have a great relationship with family is a challenging one. I am 31 years old with a family of my own, but my dad is as well-know now as he ever has been. The general assumption is that our family - my parents, my 4 siblings, the spouses, and me – must just have a blast being related to John Piper. The reality is that we have family dysfunction and difficulties, much like many (most?) families in the church do. Trevin: So, how did you manage the expectations that came along with those assumptions? Barnabas: As a kid and up through my teen years I generally tried to meet the expectations, largely out of a sense of pride. I wanted to be seen as the guy who had his spiritual life pulled together. I did love Jesus and I did want to follow the Lord, but my motives were pretty hollow. In terms of expectations I face now, I work hard to align myself with who I’ve come to realize God made me to be. I have my own family, my own gifts, my own area of ministry. If I try to live up to people’s expectations, I will miss that and fall short of what I have been given to be and do. The flip side is that, as frustrating as those expectations can be and as annoyed as I can get at them, I need to show people grace. I’m not a terribly gracious person, but no good comes out of lashing out or getting impatient. Trevin: I hear people talking today about the need for a pastor to “pastor his family” first. You say this is bad advice. Why? Barnabas: It’s bad advice because of what the term “pastor” has come to mean. I know people mean well by using it, but “pastor” is a job title loaded with a thousand expectations. Pastors are, in many cases, expected to be supermen – morally superior, intellectually sound, theologians, counselors, preachers, teachers, businessmen, accountants, strategists, leaders, etc. If they bring those same sorts of expectations home nobody will benefit. Either they will think too much of themselves or feel like a failure. Pastors’ kids don’t want superman. They want a present, loving father. Trevin: We’ve talked about the particular challenges PKs face. You also write about the great benefits of being brought up as a pastor’s kid. What are some benefits to being a PK you think may surprise those who haven’t walked that road? Barnabas: The thing that surprised me most as I interacted with PKs was how many came through some really difficult struggles and are now serving in the church. It’s what really made me think about the unique benefits PKs have. We heard more Bible than just about any of our peers growing up, and no matter if we agree theologically with our parents or not, just the absorption of so much Scripture is a blessing. It is the raw material God can use later to grow us and shape us. We grew up in and around the church and got to learn how it works from the inside out – the leadership, the relationships, the good, the bad. This prepares us well to serve in the church later with no disillusions. A PKs love for the church is not an infatuation that the shine will come off. It is an informed, “I know this place is a mess and love it any way” type of love. I think the last unique thing that stands out is that many PKs have had the chance to see God work in ways others haven’t. When your parents are praying over people in your home. When you attend conferences and retreats every couple months, when someone new is always at the table for Sunday dinner you see and hear a lot of what God is doing. Yes, the missionary slide shows were boring as a kid, but they made me so much more aware of God’s presence and of people in every part of the world. It is those kinds of subtle, little things that add up into a great big benefit for PKs.